Following the tradition, we will first lay down the HTML markup of the slideshow. 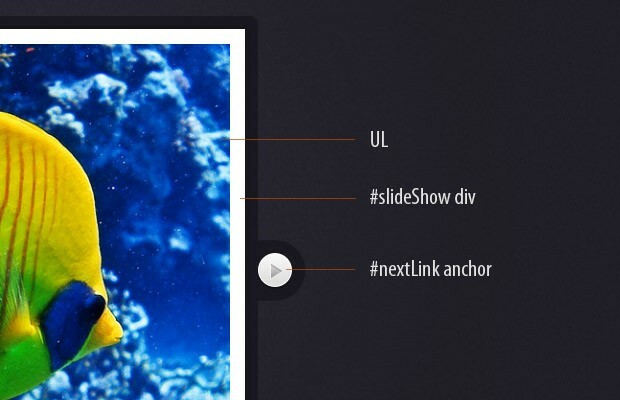 The main container element is the #slideShowContainer div, which holds the #slideShow div and the previous / next links (turned into arrows with CSS). The slides are defined as LI elements inside of an unordered list. Notice that the width of the images is set to 100%. This way they will scale according to the width of the #slideShow div. At the bottom, we include the jQuery library, our own script.js file, and the jQuery rotate plugin. We are using the plugin, so we can work with CSS3 rotations in a cross-browser fashion, as you will see in the last step of this tutorial. This layout relies heavily on relative and absolute positioning. You can see the styling of the slideshow below. 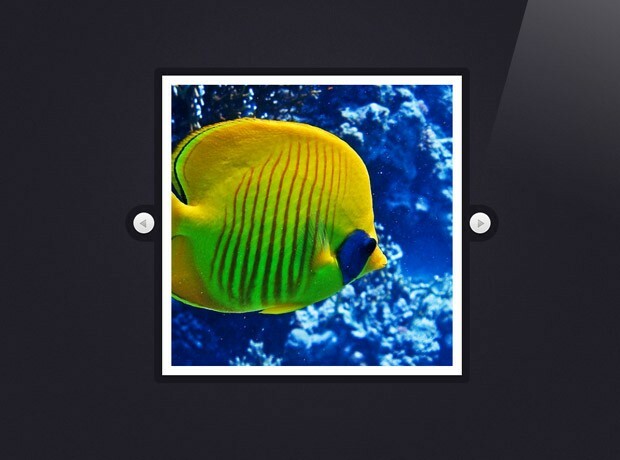 Although the #slideShow div is set to a width of 490px, its full size is actually 510px. This 20px difference scales down the slide images (as they are locked to the width of the #slideShow div), which are reduced from their normal size of 480px down to 460px. As you will see in the next step, we are using a jQuery animation to zoom in the slideshow to its full size. This way, even at full zoom, the images are actually at their regular size and there is no loss of quality. Although most modern browsers support CSS3 rotation, it is still rather tedious to work with the various vendor-specific properties. Luckily, there are plugins available that handle the cross-browser nonsense for us. I chose the jQuery rotate plugin, as it also integrates perfectly with the animate() and css() methods of the library, which means we can easily animate the rotation of elements. 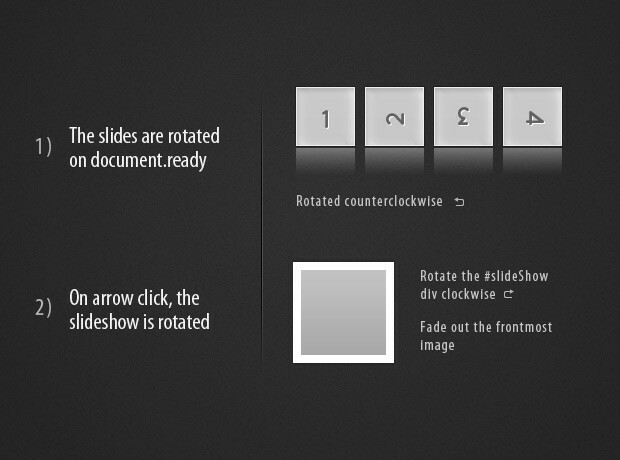 As you will see in a moment, we are using this in our custom rotateContainer event, which rotates the #slideShow div. // As the images are positioned absolutely, the last image will be shown on top. // are passed when the event is triggered later on in the code. // degrees so we can add +90 or -90. // show the previous / next images in the slideshow. I am using jQuery's $.support object to test whether the visitor's browser supports CSS3 transformations. We are only going to display the rotation in browsers with transformation support, like the newer versions of Firefox, Chrome, Safari and Opera, while falling back to a plain fade in/out version of the slideshow in the rest. Internet Explorer does provide a solution for rotating elements via its proprietary filter syntax, but it can't handle the technique we are using for this slideshow. So, in effect, you are going to see a working slideshow in any browser, but only enjoy the fancy version in those that have support for it. In the code above, you can see that we are binding a number of custom events. showNext and showPrevious are what we are using to control the slideshow. These in turn execute the rotateContainer event, and pass the direction and degrees as parameters (you could merge them into a single parameter, but I find it clearer this way). // triggering the appropriate event. // This function updates the z-index properties. // The CSS method can take a function as its second argument. // i is the zero-based index of the element. In the second part of the code, you can see the fragment that is executed only in browsers that do not support CSS3 transformations. Notice that in this case, we also define the same showNext and showPrevious events, but here they just fade in / out the images, without starting a rotation. The updateZindex() function is important, as otherwise the slides would be displayed in reverse order. This function loops through the elements in the order they currently are, and assigns a z-index property, so they are displayed correctly. With this our Rotating Slideshow is complete! Using jQuery we created a beautiful rotating slideshow, with which you can showcase your images and add a bit of interactivity to your pages. How would you improve this example? Be sure to share your thoughts in the comment section below. Awesome technique. Will definitely incorporate this on a future website! Very nice slideshow effect! Bookmarked! Nice example and good to see and learn how to write proper code. But don't think I could use it in any of my projects, just too playful. I discovered that the people want a simple gallery. even the good "old" lightbox gallery is somehow too much. All I can say is great tutorial. its really cool.........i like it. This is a really great tutorial.. thanks..!! Great tutorial as usual! I hope to try this out my portfolio page. Unusual way to show pictures in the slideshow. However there are not many websites where that kind of slideshow could be used. Rotating don't work on Internet Explorer 9. Great tutorial and great rotating css 3 and jquery effect I love it for one of my sites, thank you! Very beautiful effect. Your site rocks! That's a very nice gallery, really nice transition. Thanks. hello, how I can do to automatically change the image every 30 seconds? You might find this article interesting. If you follow the steps you should be able to make this slideshow auto-advance as well. I am having problems with the gallery. After I click through all of my images it will start to only rotate them at 90 degrees and then 180 degrees until I go through all of the photos. I want a full rotation on every click. I need to change the dimensions of the photos from what you have in this sample from 480 x 480 px to other dimensions. Hi, Great tutorial and really nice affects. I'm having a problem, though, in the rotate.js -- in the function UpdateZindex() -- it's updating the z-index for ALL the ul's on the page preceding the /div that I want to be rotated. Any ideas on how to limit the z-index update to just the slideshow /div??? Not sure if you figured it out, but I figured I'd post the solution as others may run into the same problem. Basically the script.js code was not correctly identifying which list items to make changes too. So you have to explicitly state it via the IDs. Actually, you don't need to make the changes to the declarations area... just the three specific lines. thanks! i don't want the rotation, so i took out a chunk of code and still have a beautiful, functional slideshow (surprising how hard it can be to find that!). I have a problem with the gallery if I usemore than of 8 pictures. Apparently the UpdateZindex() stop to work properly and I have a 90° rotation every time the user press the next button. You can see the problem if you test the demo. I also have the same problem, if I have more than 4 images at the end of the first cycle <li>, the second cycle, I see the images rotated by 90 ° in the direction, how do I fix this problem? I wanted to thank you for this! With some small jiggering, I managed to implement this for great effect for a client! It's a totally awesome script! I too am seeing odd rotation--I think a bit different from the above reports (using Firefox 13). With 18 images listed, going through the second time rotates them 180 degrees (and back to normal on a third go-round). Cutting back to four images results in a 90 degree rotation with each cycle. Also, I'm not crazy about the handling of non-square images, as I see either end of the next image crisscrossed underneath the present image at any given time. Is there any way to eliminate this (without just cropping my images to squares)? can we use this for both personal and commercial for free? I am having the flip problem with over four graphics as well, sorry to be doing a 'me too', but can anybody give me a fix, please? Hi. I need to make this slide to autoplay. Can somebady help me to make this script to autoplay? I meen this script. First of all a big thanks for your effort! I have little knowledge of html&css (just started), but your tutorial helped me include a proper slideshow in my homepage. But I also have the problem, that the pics get rotated wrong after you went through the slideshow the first time. I tried to google the prob but with little to no success. Isnt there a way of defining the last picture in the slideshow as such, so the show would stop at the end? Please give me a little tip how to do it or where to look it up! Great script, but there is an error on line 41 of script.js. If I have more than one <ul> on my website it clone the first of it.